In this pamphlet, Daniel Defoe responds to Sir Humphrey Mackworth’s argument against religious toleration. Mackworth had claimed that political peace could be attained by restricting government positions to those who belonged to the Anglican Church. 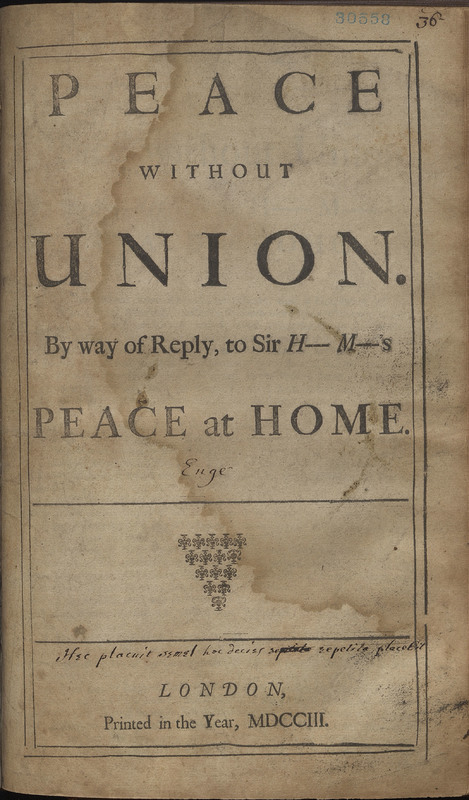 Defoe contends that restricting the rights of those outside the Church of England would not only fail to bring about peace, but would also fail to unify the nation. Defoe’s response had four editions published between 1703 and 1704, evidence of its popularity among English readers. Peace Without Union. By Way of Reply to Sir H---M---'s Peace at Home. London: [s.n. ], 1703. A version of this text has been digitized and is available through Lehigh's digital library.